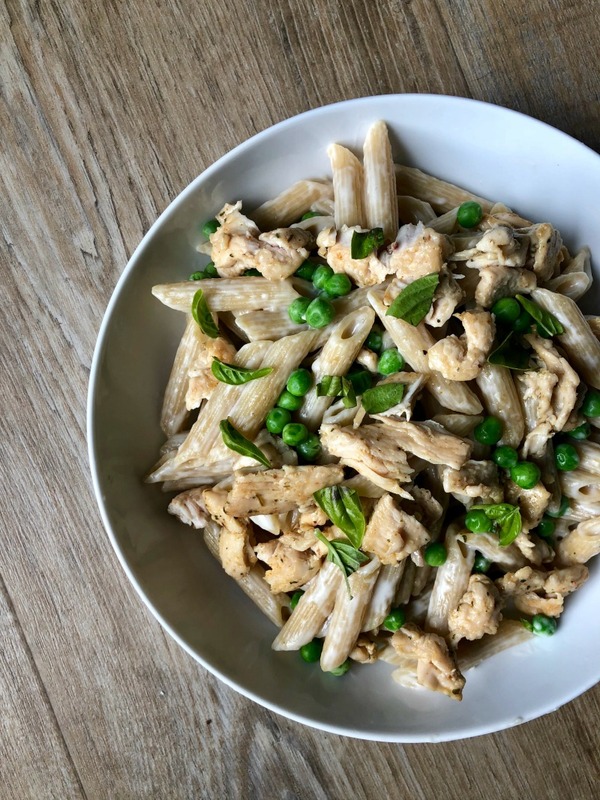 This 20 Minute Chicken Alfredo is lightened up and super easy to make. The Alfredo sauce is made in the blender and the whole dinner comes together in 20 minutes. Use leftover chicken or buy a rotisserie chicken from the store and shred that. You could easily swap the peas for broccoli or other green vegetable. The kids love helping make this one! Heat a large pan of water over high heat and bring to a boil. Cook penne according to manufacturers directions. Add peas 1 minute before pasta is done. Drain pasta and peas and transfer to a large bowl. Add the shredded chicken. While the pasta cooks, make Alfredo sauce. Add milk, cream cheese, flour, and salt to blender. Blend until thoroughly combined. Heat a medium-size sauce pan over medium heat. Add butter and melt. And garlic and cook for 30 seconds- just until fragrant- taking care not to burn. Slowly add the milk/cream mixture and stir for 3-4 minutes until sauce starts to thicken. Gently cook one minute more. Remove from heat and add stir in the parmesan cheese. If sauce gets too thick, thin it with just bit of milk. Season with extra salt if necessary. Pour the Alfredo sauce over the pasta and stir to combine. Top with fresh basil and a handful of parmesan if desired.